Matsuyama (松山市, Matsuyama-shi, [màtsùꜜyàmà]) is the capital city of Ehime Prefecture on the island of Shikoku in Japan and also Shikoku's largest city, with a population of 516,459 as of December 1, 2014. It is located on the northeastern portion of the Dōgo Plain. Its name means "pine mountain". The city was founded on December 15, 1889. The city is known for its hot springs (onsen), among the oldest in Japan, and is home to the Dōgo Onsen Honkan, a Meiji Period wooden public bathhouse dating from 1894. A second favorite tourist spot is Matsuyama Castle. Eight of the eighty-eight temples in the Shikoku Pilgrimage are in Matsuyama. Matsuyama was in medieval times part of the Iyo-Matsuyama Domain, a fiefdom of Iyo Province consisting mainly of a castle town, supporting Matsuyama Castle. There was a nearby village at Dōgo Onsen to the east and a port somewhat farther to the west at Mitsuhama providing a link to the Japanese mainland (Honshū) and Kyūshū. Dōgo Onsen was already famous in the Asuka period, as Shotoku Taishi visited the spa in the year 596. It is also mentioned in passing in The Tale of Genji. The site of the former Yuzuki Castle is nearby. Famous Buddhist temples in Matsuyama include Ishite-ji (石手寺), Taisan-ji (太山寺), and Jōdo-ji (浄土寺), all dating back to the 8th century, although the oldest surviving buildings are from the early 14th century, as well as Hōgon-ji (宝厳寺), Taihō-ji (大宝寺) and Enmyō-ji (円明寺). Famous shrines of the city include Isaniwa Jinja (伊佐爾波神社), built in 1667. The haiku poet Masaoka Shiki lived in Matsuyama. His house, now known as the Shiki-do, and a museum, the Shiki Memorial Museum, are popular attractions, and the centerpieces of the city's claim as a center of the international haiku movement. Other famous haiku poets associated with Matsuyama include Kurita Chodō, whose Kōshin-an was visited by Kobayashi Issa, Shiki's followers, Takahama Kyoshi and Kawahigashi Hekigoto, and Taneda Santōka. Santoka's house, known as Isso-an, is also a tourist attraction and is periodically open to the public. The Matsuyama Declaration of 1999 proposed the formation of International Haiku Research Center, and the first Masaoka Shiki International Haiku Awards were given in 2000. Recipients have included Yves Bonnefoy (2000), Cor van den Heuvel (2002) and Gary Snyder (2004). The famed novel Botchan by Natsume Sōseki is set in Matsuyama. As a result, there are numerous sites and locales named after the main character, including Botchan Stadium, the Botchan Ressha (an antique train that runs on the city's tramway), and Botchan dango. Matsuyama also figures in several works by Shiba Ryōtarō, notably his popular novel, Saka no ue no kumo [Clouds Above the Hill] (1969). In anticipation of the upcoming NHK Taiga drama adaptation of Saka no ue no kumo, a Saka no ue no kumo Museum was established in 2007. Matsuyama was also the setting of a 1907 novel about the Russo-Japanese War, As the Hague Ordains, by American writer Eliza Ruhamah Scidmore. Matsuyama figures in the novel because the city housed a camp for Russian prisoners during the war. A Russian cemetery commemorates this important episode in Matsuyama history. The Russo-Japanese War is also remembered in Matsuyama because of the contributions of two Japanese military leaders, the Akiyama brothers, Akiyama Saneyuki and Akiyama Yoshifuru, who were born in the city. In the twentieth century, various mergers joined the castle town with neighboring Dōgo, Mitsuhama, and other townships, aided by urban sprawl, creating a seamless modern city that now ranks as the largest in Shikoku. As of the most recent merger, on January 1, 2005, absorbing the city of Hōjō, and town of Nakajima (from the former Onsen District), the city had an estimated population of 512,982 and a population density of 1,196 persons per km². The total (merged) area is 428.86 km². Matsuyama is home to several universities including Ehime University (part of the Japanese national university system) and several private colleges, including Matsuyama University and Matsuyama Shinonome College. Matsuyama has several important museums. The Museum of Art, Ehime is the city's main art museum, its collections emphasizing the works of regional artists. The Shiki Memorial Museum is a museum that focuses on the life and work of Masaoka Shiki, with special attention to his contribution to haiku. The Saka no ue no kumo Museum features exhibits connected with the famous novel and television series. There is a Juzo Itami museum dedicated to the famous film director. Famous products (meibutsu) of Matsuyama include tarts and Botchan dango. 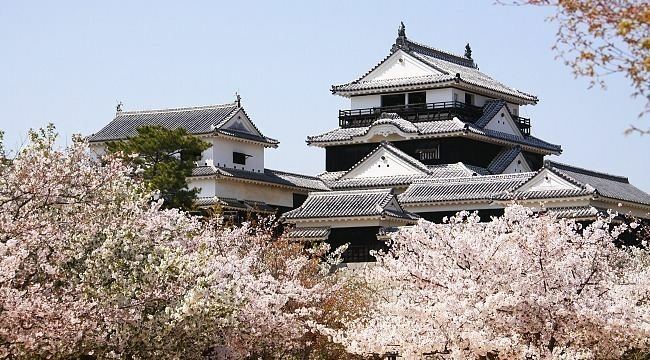 In the 17th century, the lord of Matsuyama castle Sadayuki Matsudaira (松平定行) introduced the process of tart-making, originally brought to Japan by the Portuguese, to Matsuyama. At first it was a Castella with jam. According to legend Sadayuki made some changes, such as adding red bean paste. Now there are many kinds and makers of tarts in Matsuyama; some add yuzu paste or chestnut to the red bean paste. In addition to tarts, Botchan dango is also a famous product of Matsuyama. Botchan dango was named after the famous novel Botchan by Natsume Sōseki. It consists of three bean paste beads of three flavors, matcha, egg, and red bean paste. Within the paste is contained mochi. Matsuyama is the site of a number of festivals, including the Dogo Festival, held in the spring, the Matsuyama Festival, held in August, and the Fall Festival, held in October, which features battling mikoshi. The city is represented in the J. League of football with its local club, Ehime F.C.. The Ehime Mandarin Pirates also represent the city in the baseball Shikoku Island League Plus. Matsuyama has a humid subtropical climate (Köppen climate classification Cfa) with hot summers and cool winters. Precipitation is significant throughout the year, and is heavier from April to July as well as in September. Matsuyama has a well-developed transport network. It is connected to the Japanese national railway network by Matsuyama Station on the Yosan Line. It also has a network of suburban railways run by the Iyo Railway, which is centred on Matsuyama City Station. Iyo Railway also operates a system of trams and busses, which serve as the city's main modes of public transportation. Matsuyama is one of the few Japanese cities that did not do away with its original tram system, which has continually operated from 1887. Matsuyama Airport offers flights to Tokyo, Seoul, Shanghai, and various other cities. There is regular ferry service to Hiroshima and regular night ferries to Kobe, Kokura Kita-ku, Kitakyūshū, and several other destinations. Also, hydrofoil service exists between Hiroshima and a few other destinations. Miura (boiler manufacturer), Iseki (tractor and engine equipment), Hatada Ichiroku (Japanese style confectionery), Poem, a food processing division of Pom (Ehime Drink Company), and the retailing companies Fuji and Daiki all have their headquarters in Matsuyama. The city has a North Korean school, Shikoku Korean Elementary and Junior High School (四国朝鮮初中級学校). There is also Ehime Prefectural Matsuyamahigashi Senior High School (愛媛県立松山東高等学校), which was modeled on the Middle School located in Matsuyama in "Botchan", Japanese modern novel written by Natsume Sōseki in 1906, Meiji period. That novel was based on his experience of teaching English there, but the main character is the mathematics teacher from Tokyo Physics School (present day Tokyo University of Science).